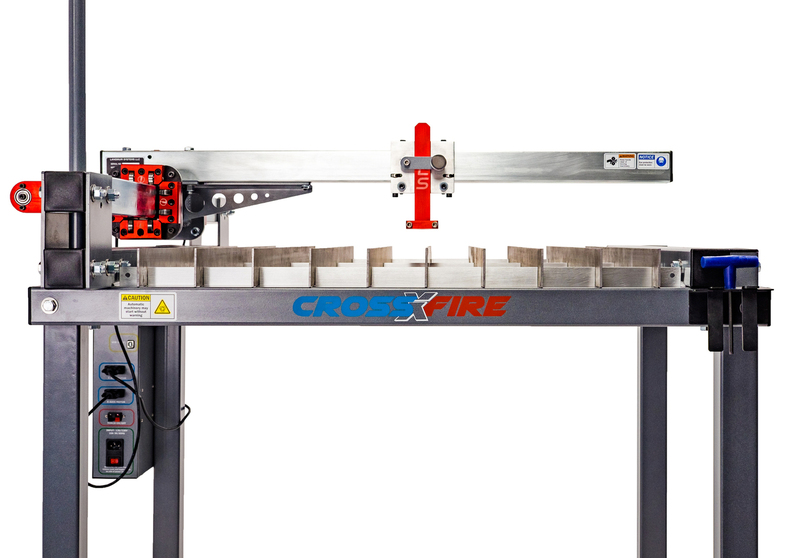 Learn about features that make the CrossFire™ machine a revolutionary new addition to your home shop or small business. 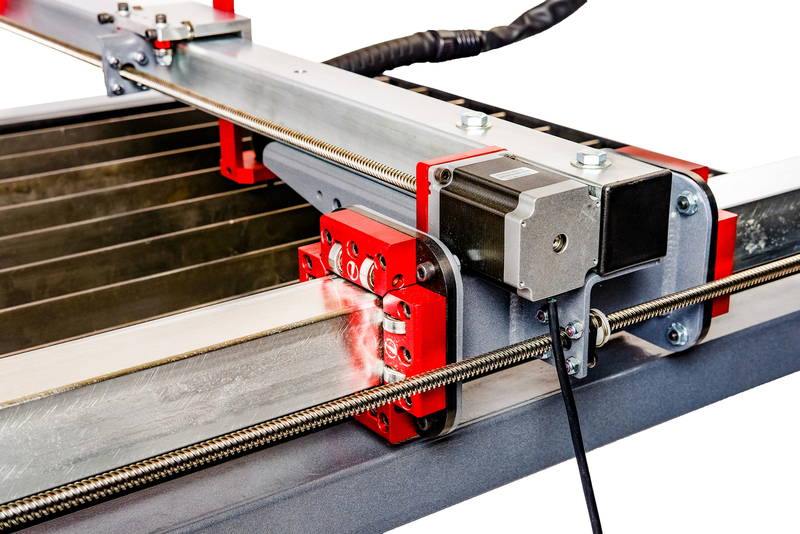 CNC plasma cutting has never been so simple! 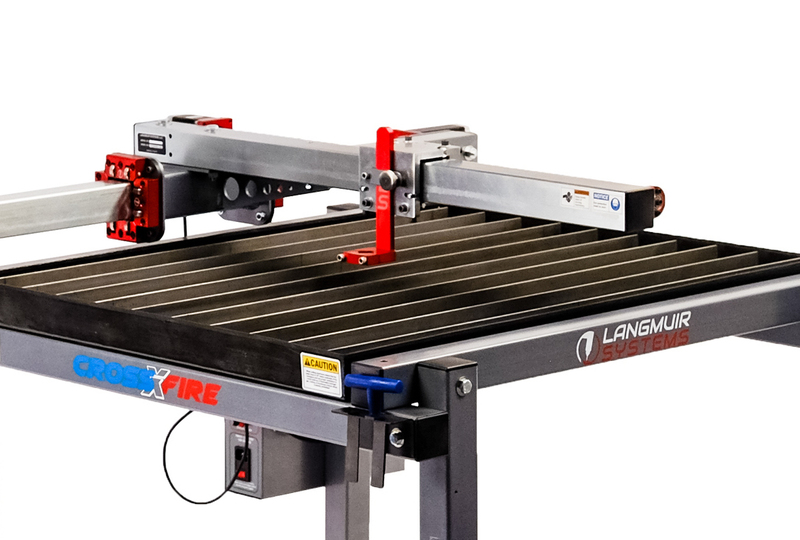 The CrossFire™ CNC plasma machine features a fully cantilevered gantry system for torch movement which allows for complete and unhibited access to the cutting surface for a wide variety of plate shapes and sizes. 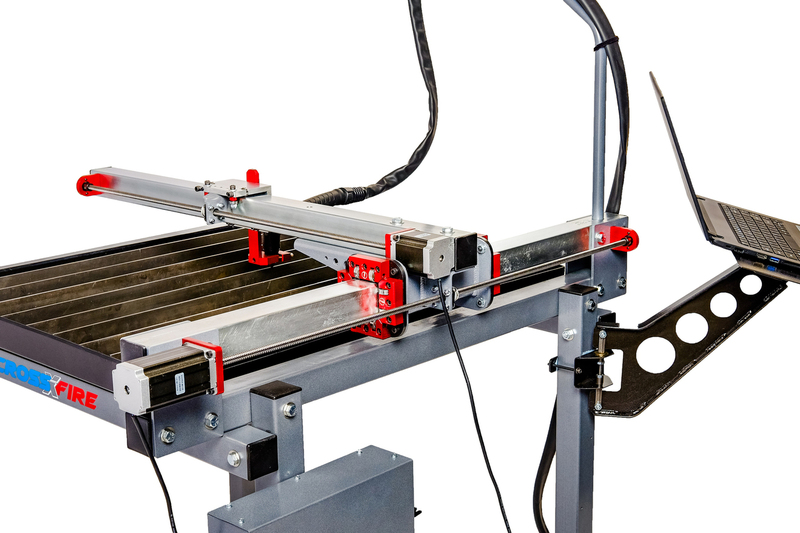 By indexing material through the machine, the CrossFire™ is capable of cutting much larger sheets of material through subsequent setup operations. No more are the days of needing an old computer with a parallel port to run your CNC machine. 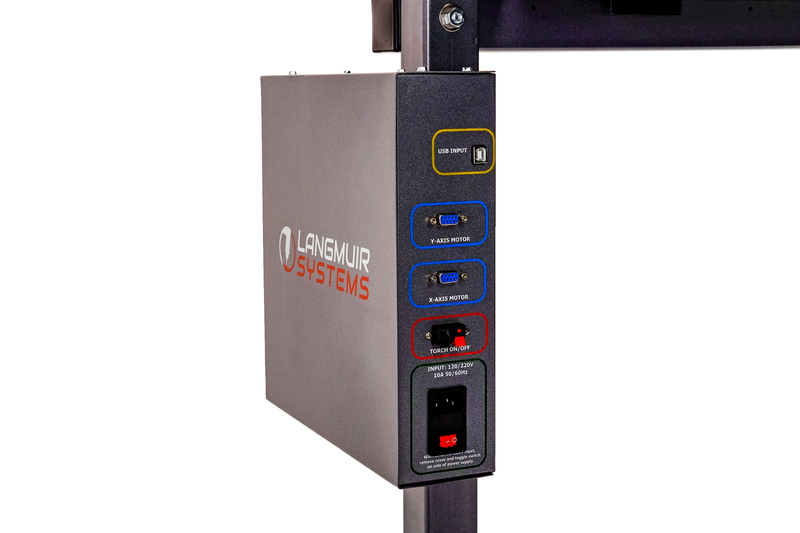 The CrossFire™ electronics enclosure comes standard with a USB port for quick and easy connectivity to your computer. The CrossFire™ CNC plasma machine is compatible with any computer running Windows XP/Vista/7/8/10. Each machine drive system comes equipped with two precision multi-start lead screws coupled with two anti-backlash wear compensating lead nuts. The aggressive pitch of the multi-start lead screws allows for maximum travels speeds of 250 inches per minute while maintaining peak motor torque. With the wear compensating anti-backlash lead nuts, you'll never have to make micro-adjustments to your setup over time. 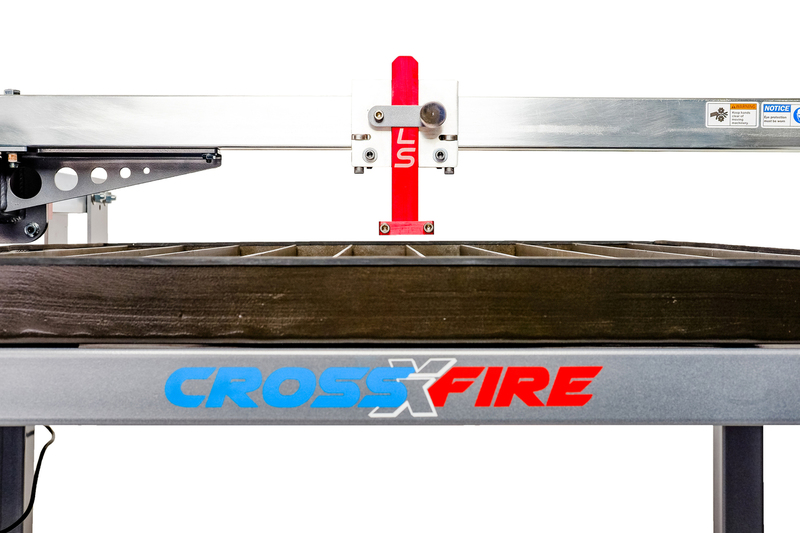 The torch carriage on the CrossFire™ was designed to be lightweight and accurate for smooth motion on the cantilevered gantry. The torch carriage is CNC machined from aircraft-grade 6061-T6 billet aluminum and the torch slide assembly is anodized red for a finished look. The rigid all-steel construction features structural tubing and vertical plate stanchion supports for increased strength. 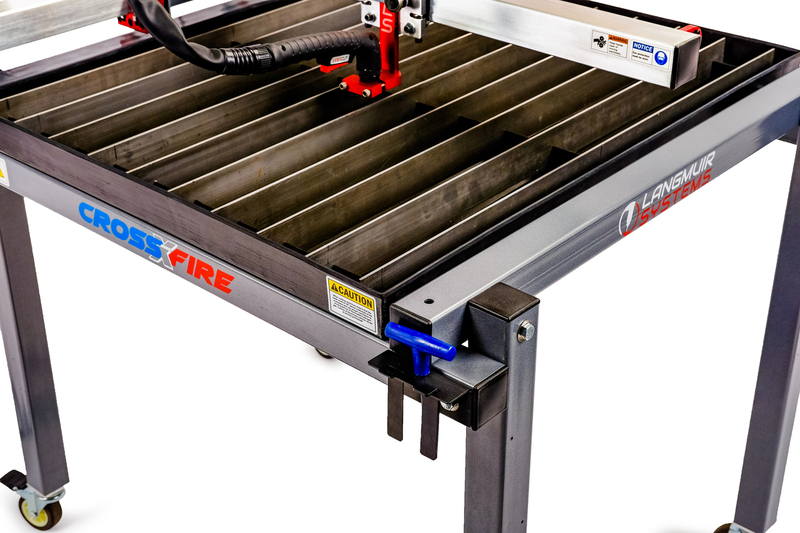 In addition, the unique triple-pocketed frame design provides for a stiff table surface that can support steel plate material up to 1" thick. Each steel component on the frame is powdercoated metallic gray for a long-lasting and wear resistant finish. 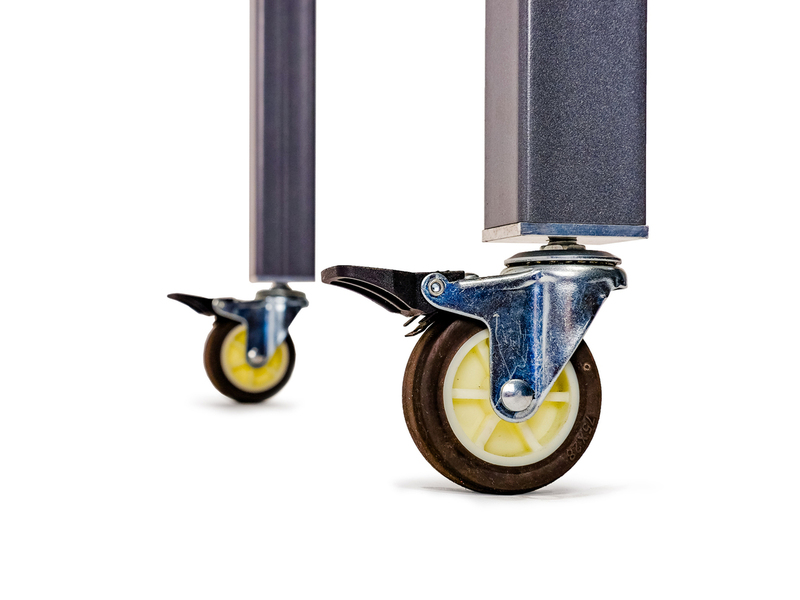 Both X & Y axes carriages come equipped with full size double shielded industrial ball bearings for smooth and accurate motion. 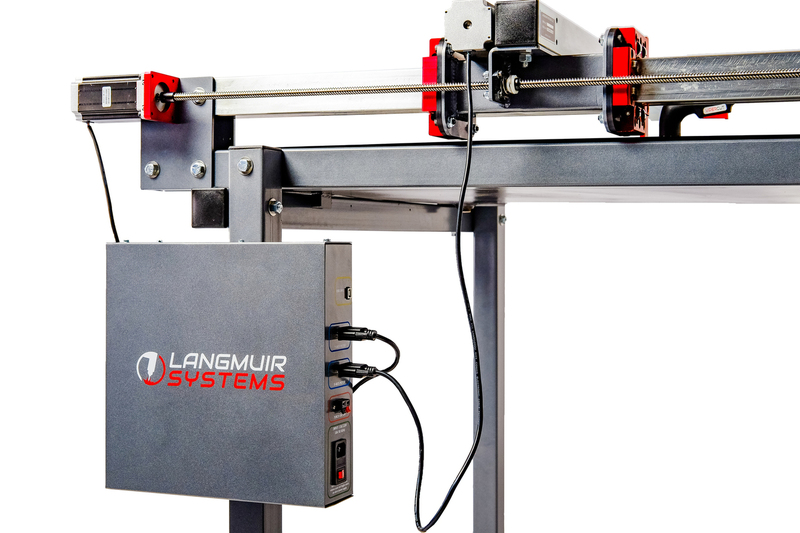 The X axis gantry carriage includes a total of 16 ball bearings while the Y axis torch carriage includes 8. The torch carriage assembly features a stainless steel thumb screw on the torch slide for quick and easy torch height adjustment. Each table comes equipped with four steel leg tubes and four swivel casters. 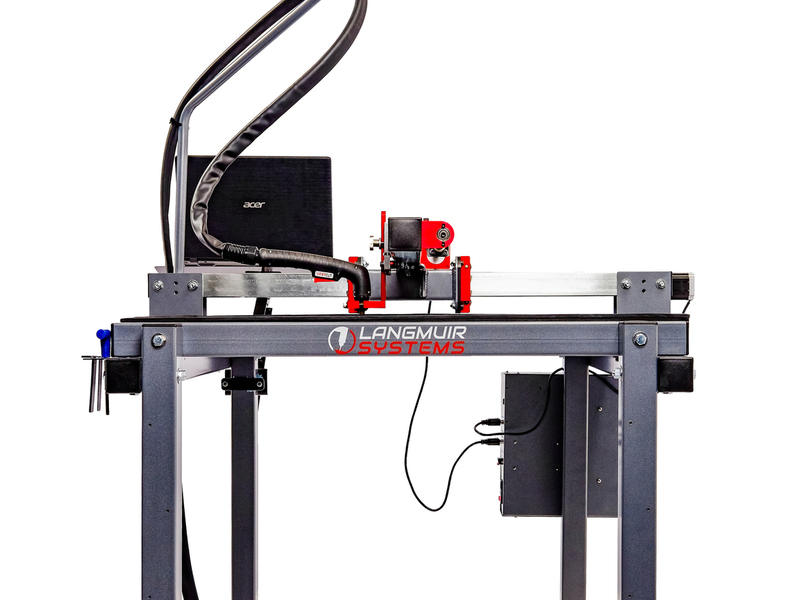 This allows the table to be moved around your shop for convenient cutting and to also be stored away when not in use. Two of the casters are locking casters to secure the table in place when cutting. 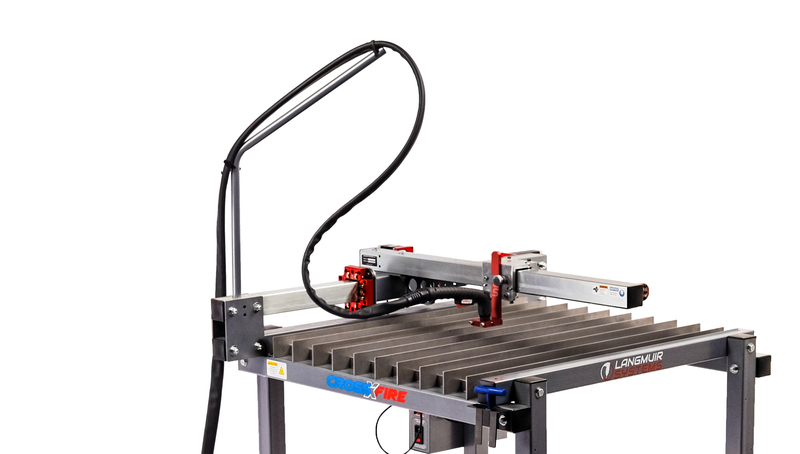 The CrossFire CNC plasma machine features a dual rail drive system manufactured from zinc electroplated steel tubing for maximum corrosion protection. The integrated electronics system features an input for automatic torch firing. This sysytem allows the computer control software to automatically fire the plasma torch at the start of each cut when executing a program. Simply wire up your plasma cutter and start cutting! Each machine includes a leg mounted T-handle hex key for quick release of the plasma torch. 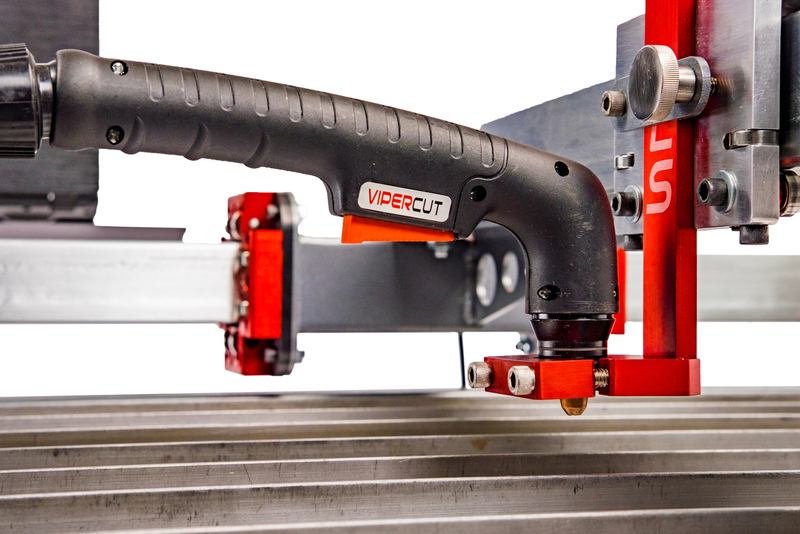 This makes it quick and easy for removing the hand torch from the V-block mount when making manual cuts off the machine. In addition, two height-offset shims are included for quick torch cut-height adjustment. Each machine comes equipped with a universal V-block torch mount which can accept any standard hand or machine plasma cutting torch. 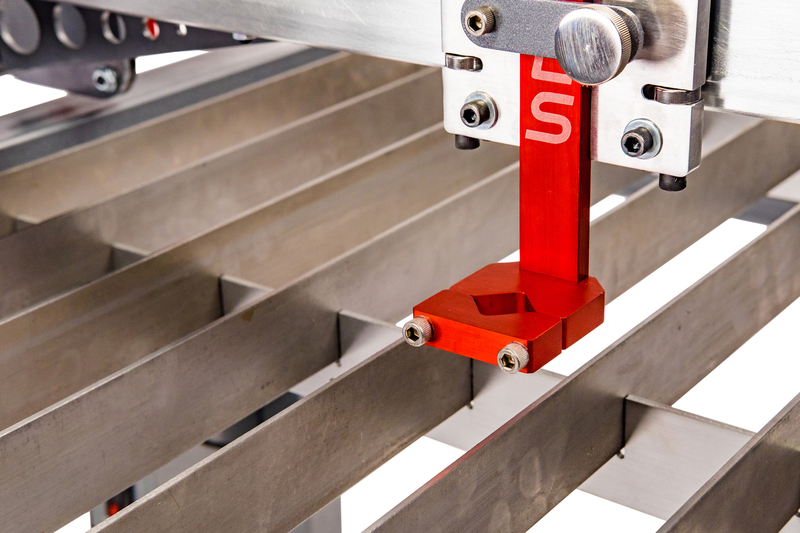 The CrossFire™ was designed with an open slat surface that sits flush to the steel tube frame. 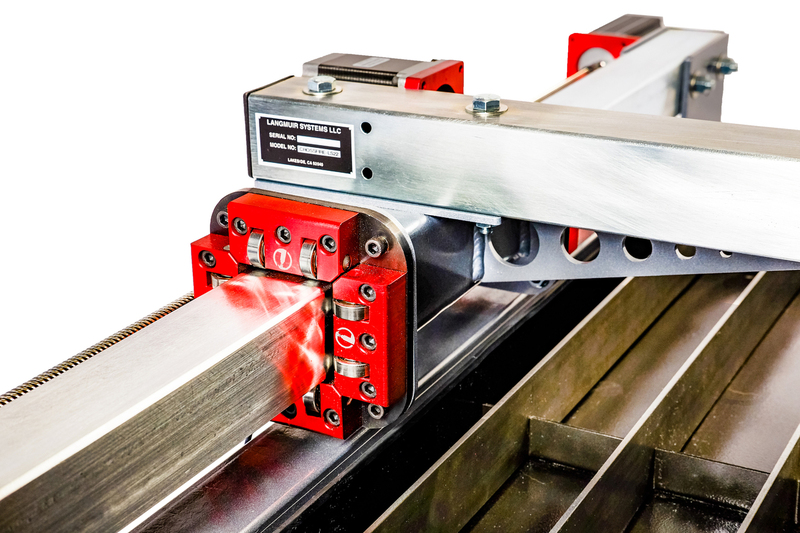 This permits open access to much larger plates and allows for material to be clamped directly to the tube frame when cutting. Each machine is equipped with a 2.5 ft tall steel swivel pole for support of the plasma torch cable when cutting. 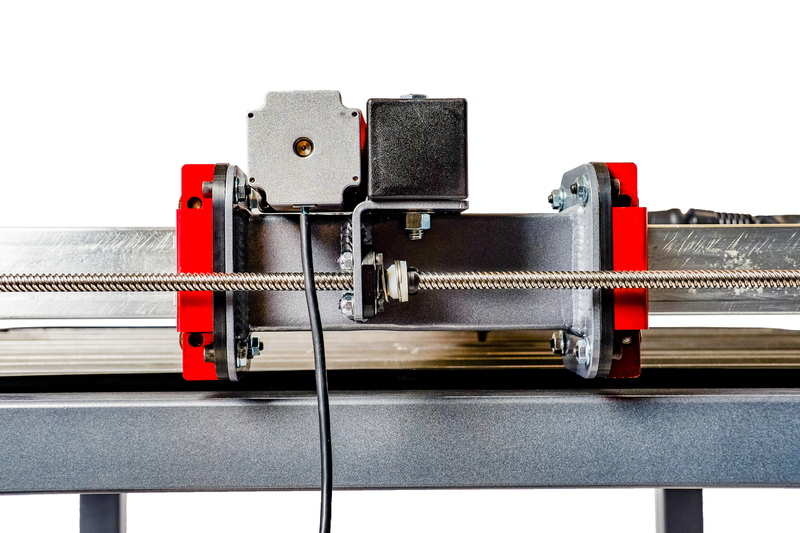 The CrossFire™ features two high torque hybrid bi-polar stepper motors manufactured by Smart Automation. The X-axis torch carriage motor has a torque rating of 280 oz-in and the Y-axis gantry carriage motor has a torque rating of 420 oz-in.